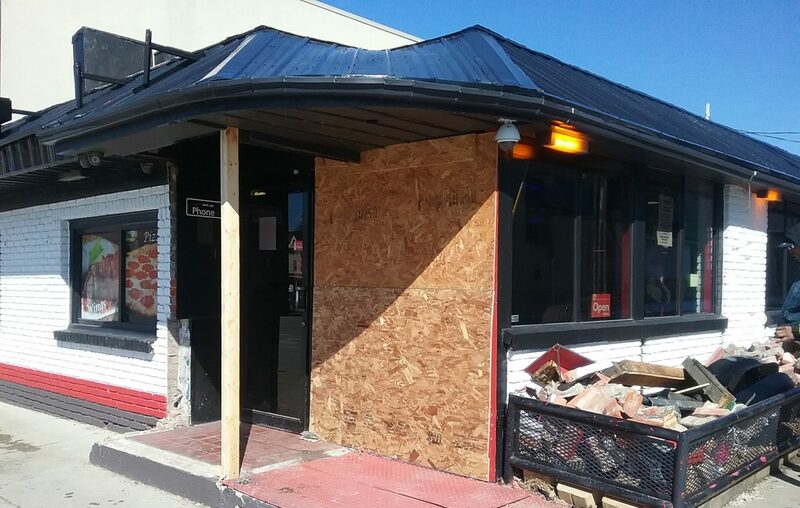 Destiny's restaurant has faced more than its share of adversity this month. First, the restaurant voluntarily closed for 48 hours after a cook there was diagnosed with hepatitis A. Then, on Saturday morning, just two days after a news conference to announce the Fillmore Avenue restaurant was open again, an SUV lost control on black ice and crashed into the front of the building. Destiny's is temporarily closed again. A railing needs to be installed in front of the building, to ensure the safety of customers walking in and out of the front door, said Thomas Childs, the restaurant's owner. Childs said he hopes to reopen the restaurant soon, possibly Monday or Tuesday. How is Childs dealing with so much adversity? The vehicle that crashed into the Destiny's building near Main Street about 10:30 a.m. shattered a plate glass window, right next to a table and chairs. No one was sitting there. Childs said there were three customers in the restaurant at the time but no one was injured. The driver, who was later taken to Erie County Medical Center, got out and peered inside the restaurant. “He looked like he was pretty concerned,” Childs said. Childs said the restaurant was getting back to its rhythm of business when the accident occurred. “People have been coming back,” he said. Now he faces another disruption. Destiny’s operates seven days a week, and Saturday night is typically a busy time. On March 12, the Erie County Health Department announced that a cook at Destiny's may have exposed coworkers and hundreds of patrons to hepatitis A while working at the restaurant between Feb. 9 and March 11. Childs closed the restaurant for 48 hours. Childs said he would like to see everyone encouraged to get a hepatitis A shot, the same way people are recommended to get a flu shot. “Don’t wait until an episode happens and then have everyone running scared to get it,” he said.